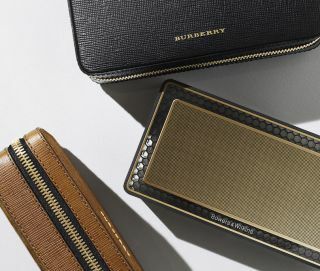 B&W and Burberry team up for T7 Gold Edition wireless speaker | What Hi-Fi? Calling all hi-fi fashionistas. If you happen to find the finish of B&W's brilliant T7 wireless speaker a little plain, the new Gold Edition, designed with the help of Burberry, could be right up your street. The changes are purely aesthetic - the T7 Gold Edition gets a glitzy new gold trim and gold grilles front and back. Sound quality should still be as excellent as from the original. The big news is that this new version boasts its own Burberry-designed protective case. You can choose from either black leather or tan suede. Each features an embossed Burberry logo in gold-finish material. B&W’s premium portable speeaker already has a glowing five-star review to its name, and features aptX Bluetooth, impressive battery life and sound quality to match. Being associated with the Burberry luxury brand, the Gold Edition T7 doesn't come cheap, of course. At £595, it's almost double the price of a standard T7. Is it worth the premium? If you think so, the B&W T7 Gold Edition is available to buy now.